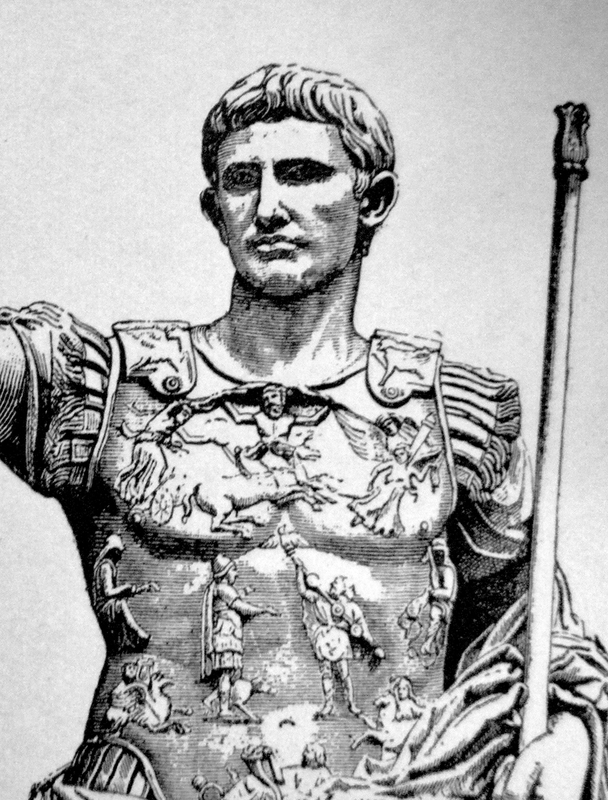 Gaius Octavian, the nephew of Julius Caesar, was born on September 23, 63 B.C. Octavian's father died when he was just 4 years old. As a result, he would be raised by his mother, Atia, who would make sure that he received the finest education possible. It would be his uncle, Julius Caesar, who would have the greatest influence on his life. After witnessing Cesar's triumph in Rome in 46 B.C., Octavian traveled to Spain to be with his uncle. In route, his ship wrecked and the journey was very difficult. When Octavian finally arrived at Julius Caesar's camp he was a total mess, suffering from a variety of problems, but his uncle liked his fortitude. Julius rewarded his nephew by providing him with military training. Octavian was sent to study the arts of war, and philosophy in the town of Apollonia, in Epirus (northwestern Greece). After just a short time, he received bad news that his uncle Julius had been assassinated. Upon his return home, Octavian found that the assassination had touched off civil wars. He also found Mark Anthony, Caesar's closest confidant, doing everything he could to take control of Rome. At the time, Octavian could only think about getting revenge for his uncle's death. It didn't take long before the Roman Senate made Octavian a senator in the hopes of snubbing the aggressive Mark Anthony. The two would meet on the battlefield during April of 43 B.C., and Octavian would emerge the victor. As a result, Octavian received the top position in the Roman government. He was now a consul. Octavian realized that if he were going to be successful, he needed to get along with Mark Anthony. On November 27, 43 B.C., he formed a Second Triumvirate with Mark Anthony and Marcus Lepidus, a Roman general. All three wanted revenge for Caesar's death, and they would get it at the Battle of Philippi. After losing the battle, Brutus and Cassius would be forced to commit suicide. Soon afterward, Octavian divided the empire into thirds. Octavian ruled the west, Anthony the east, and Lepidus ruled Africa. However, Lepidus would have little power and the struggle between Anthony and Octavian had just begun. In October of 32 B.C., the western provinces swore allegiance to Octavian making war inevitable. Then, on September 2, 31 B.C., Octavian defeated Anthony and Cleopatra of Egypt off the west coast of Greece. They would also commit suicide. Next, Octavian conquered Egypt. Octavian would use the treasure that was seized in the sacking of Egypt to pay off his troops and debts. At the same time, he rewarded many of his war veterans by giving them land to farm . On January 13, 27 B.C., Octavian returned the power to the Roman Senate. The empire was finally out of the hands of dictators. In return for his generosity, Octavian was given control over Spain, Gaul, and Syria for ten years. Octavian devoted the next years attempting to revive Roman religion. On January 16, 27 B.C., he was given the title Augustus, which signified that he was larger than life or semi-divine. Eventually, he was appointed to the highest position in the Roman religion, pontifex maximus. Augustus ruled Rome for 44 years before dying in 14 A.D. After his death, his family would continue to rule for 50 more years.